Greta Ernman Thunberg (Swedish pronunciation: [²ɡreːta ²tʉːnbærj]; born 3 January 2003) is a Swedish schoolgirl climate activist who has been described as a role model for worldwide student activism. She is famous for having initiated the school strike for climate movement that formed in November 2018 and surged globally after the COP24 conference in December the same year. Her personal activism began in August 2018, when her recurring and solitary Skolstrejk för klimatet ('School strike for the climate') protesting outside the Swedish parliament in Stockholm began attracting media coverage. On 15 March 2019, an estimated number of 1.4 million students in 112 countries around the world joined her call in the striking and protesting. The next major climate strike to take place globally is scheduled on 24 May 2019. On 13 March 2019, three members of the Norwegian parliament nominated Thunberg as a candidate for the Nobel Peace Prize later this year. Thunberg responded that she was 'honoured and very grateful' for the nomination. Thunberg has already received various prizes and awards for her activism. At a TED talk In November 2018, Thunberg said she had been diagnosed with Asperger syndrome, obsessive–compulsive disorder (OCD), and selective mutism. She added that selective mutism meant she only talked when she needed to and that 'now is one of those moments'; and that being on the 'spectrum' was an advantage 'as almost everything is black or white'. To lower her family's carbon footprint, she insisted they become vegan and give up flying, as she did herself. As a collective archetype, Thunberg has been compared both to French medieval maiden warrior Joan of Arc; and to Swedish fictional character Pippi Longstocking. 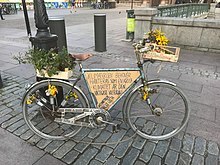 Greta Thunberg's bicycle in Stockholm on 11 September 2018: "The climate crisis must be treated as a crisis! The climate is the most important election issue!" Sign "Follow Greta! Strike for climate" in Berlin (14 December 2018). On 20 August 2018, Thunberg, who had just started ninth grade, decided to not attend school until the 2018 Sweden general election on 9 September after heat waves and wildfires in Sweden. 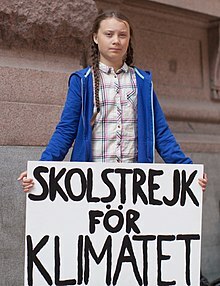 Her demands were that the Swedish government reduce carbon emissions in accordance with the Paris Agreement, and she protested by sitting outside the Riksdag every day during school hours with the sign Skolstrejk för klimatet (school strike for the climate). After the general elections, she continued to strike only on Fridays, gaining worldwide attention. She inspired school students across the globe to take part in student strikes. As of December 2018, more than 7004200000000000000♠20000 students had held strikes in at least 270 cities. Thunberg credits the teen activists at Parkland school in Florida, who organized the March For Our Lives, as the inspiration to begin her school climate strike. From October 2018 onwards, Thunberg's activism evolved from solitary protesting to taking part in demonstrations throughout Europe; making several high profile public speeches; and mobilising her growing number of followers on social media platforms. However, by March 2019 she still stages her regular protests outside the Swedish parliament every Friday, where other students now occasionally join her. Her activism has not interfered with her schoolwork, but she has had less spare time. UN General Secretary António Guterres has endorsed the school strikes initiated by Thunberg, admitting that "My generation has failed to respond properly to the dramatic challenge of climate change. This is deeply felt by young people. No wonder they are angry." Greta Thunberg participated in the Rise for Climate demonstration outside the European Parliament in Brussels. In October 2018, Thunberg and her family drove in an electric car to London, where she addressed the 'Declaration of Rebellion' organized by Extinction Rebellion opposite the Houses of Parliament. On 24 November 2018, she spoke at TEDxStockholm. She spoke about realising, when she was eight years old, that climate change existed and wondering why it was not headline news on every channel, as if there was a world war going on. She said she did not go to school to become a climate scientist, as some suggested, because the science was done and only denial, ignorance and inaction remained. Speculating that her children and grandchildren would ask her why they had not taken action in 2018 when there was still time, she concluded with "we can’t change the world by playing by the rules, because the rules have to be changed." Thunberg addressed the COP24 United Nations climate change summit on 4 December 2018 and also spoke before the plenary assembly on 12 December 2018. During the summit, she also participated in a panel talk together with representatives of the We Don't Have Time Foundation, in which she talked about how the school strike began. On 23 January 2019, Thunberg arrived in Davos after a 32-hour train journey, in contrast to the many delegates who arrived by up to 7003150000000000000♠1500 individual private jet flights, to continue her climate campaign at the World Economic Forum. She told a Davos panel "Some people, some companies, some decision makers in particular have known exactly what priceless values they have been sacrificing to continue making unimaginable amounts of money. I think many of you here today belong to that group of people." Later in the week, she warned the global leaders that "Our house is on fire", adding "I want you to panic. I want you to feel the fear I feel every day. We owe it to the young people, to give them hope." 2 emissions by at least 80% until 2030. Later, she joined the climate protests in Brussels. Greta Thunberg was one of the winners of Svenska Dagbladet's debate article writing competition on the climate for young people in May 2018. Thunberg was nominated for the electricity company Telge Energi's prize for children and young people who promote sustainable development, Children's Climate Prize, but declined because the finalists would have to fly to Stockholm. In November 2018, she was awarded the Fryshuset scholarship of the Young Role Model of the Year. In December 2018, Time magazine named Thunberg one of the world's 25 most influential teenagers of 2018. On the occasion of the International Women's Day Thunberg was proclaimed the most important woman of the year in Sweden in 2019. The award was based on a survey by the institute Inizio on behalf of the newspaper Aftonbladet. Three Norwegian lawmakers nominated Thunberg for the 2019 Nobel Peace Prize. On 31 March 2019 she received the German Goldene Kamera Special Climate Protection award. On 2 April 2019 the Prix Liberté from Normadie, France. On 12 April 2019 she shared the Fritt Ords Prize from Norway with the Natur og Undon organization. This prize is awarded for freedom of expression. On 13 March 2019, three members of the Norwegian parliament nominated Thunberg as a candidate for the Nobel Peace Prize later this year. The nominating politicians motivated their decision by arguing that global warming will be the cause of 'wars, conflict and refugees' if nothing is done to halt it. Thunberg responded that she was 'honoured and very grateful' for the nomination. If Thunberg receives the Prize later this year, she will become the youngest person ever to receive it. In April 2019, Time magazine named Greta Thunberg as one of the hundred most influential people of 2019. In the same month, the Chilean-based organization Fundación Milarepa para el Diálogo con Asia, headed by Mario Aguilar of the University of St. Andrews, announced that Thunberg had been selected as the recepient of the organization's Laudato Si' Award. After her student climate strikes gained momentum, attempts were made to discredit her by climate change deniers, and others tried to benefit from her high profile. In late 2018, Ingmar Rentzhog, founder of the non-profit We Don't Have Time Foundation (WDHT), recruited Thunberg to become an unpaid youth advisor and used Thunberg's name and image without her knowledge or permission to raise millions for WDHT's for-profit subsidiary We Don't Have Time AB, of which Rentzhog is CEO. Thunberg received no money from the company. She terminated her volunteer advisor role with WDHT, stating she "is not part of any organization… am absolutely independent… [and] do what I do completely for free." Juliana v. United States of America is a lawsuit by 21 youths against the United States for significantly harming their right to life and liberty, and seeks to force the government to adopt methods for reducing greenhouse gas emissions. ^ Nava, Alessandra (18 March 2019). "WMN role models: Greta Thunberg". Acrimònia. Retrieved 9 April 2019. ^ Lindgren, Emma (2 April 2019). "Greta Thunberg Wins German Award". Inside Scandinavian Business. Retrieved 9 April 2019. ^ Olsson, David (23 August 2018). "This 15-year-old Girl Breaks Swedish Law for the Climate". Medium. Retrieved 26 March 2019. ^ Cohen, Ilana; Heberle, Jacob (19 March 2019). "Youth Demand Climate Action in Global School Strike". Harvard Political Review. Retrieved 22 March 2019. ^ Shabeer, Muhammed (16 March 2019). "Over 1 million students across the world join Global Climate Strike". Peoples Dispatch. Retrieved 22 March 2019. ^ a b Vaglanos, Alanna (14 March 2019). "16-Year-Old Climate Activist Greta Thunberg Nominated For Nobel Peace Prize". Huffington Post. Retrieved 22 March 2019. ^ Lobbe, Anne-Marie (13 December 2018). "À 15 ans, elle remet les dirigeants mondiaux à leur place!" (in French). Sympatico. Retrieved 3 January 2019. ^ a b "School Strike for Climate: Meet 15-Year-Old Activist Greta Thunberg, Who Inspired a Global Movement". Democracy Now!. ^ a b c d Carrington, Damian (4 December 2018). "'Our leaders are like children', school strike founder tells climate summit". The Guardian. ^ Santiago, Ellyn (14 December 2018). "Greta Thunberg: 5 Fast Facts You Need to Know". Heavy.com. Retrieved 5 February 2019. ^ a b Thunberg, Greta (12 December 2018). School strike for climate – save the world by changing the rules. TEDxStockholm. Stockholm: TED. Event occurs at 1:46. Retrieved 29 January 2019. I was diagnosed with Asperger's syndrom, OCD, and selective mutism. That basically means I only speak when I think it's necessary. Now is one of those moments… I think that in many ways, we autistic are the normal ones, and the rest of the people are pretty strange, especially when it comes to the sustainability crisis, where everyone keeps saying that climate change is an existential threat and the most important issue of all and yet they just carry on like before. ^ "Climate crusading schoolgirl Greta Thunberg pleads next generation's case". The Straits Times. 5 December 2018. Retrieved 22 December 2018. ^ Hunziker, Robert (2 January 2019). "Greta 'Joan of Arc' Thunberg Shames Leaders at COP24". CounterPunch. Retrieved 22 March 2019. ^ Kluth, Andreas (17 December 2018). "Greta Thunberg reads the world's adults the riot act". Handelsblatt Today. Retrieved 22 March 2019. ^ "The Swedish 15-year-old who's cutting class to fight the climate crisis". The Guardian. 1 September 2018. ^ "The Fifteen-Year-Old Climate Activist Who Is Demanding a New Kind of Politics". The New Yorker. 2 October 2018. ^ "Teen activist on climate change: If we don't do anything right now, we're screwed". CNN. 23 December 2018. Retrieved 10 February 2019. ^ "The Guardian view on teenage activists: protesters not puppets – Editorial". The Guardian. 7 February 2019. Retrieved 11 February 2019. ^ Watts, Jonathan (11 March 2019). "Greta Thunberg, schoolgirl climate change warrior: 'Some people can let things go. I can't'". The Guardian. Retrieved 11 March 2019. ^ Guterres, António (15 March 2019). "The climate strikers should inspire us all to act at the next UN summit". The Guardian. Retrieved 18 March 2019. ^ "This Is Our Darkest Hour: With Declaration of Rebellion, New Group Vows Mass Civil Disobedience to Save Planet". Common Dreams. 31 October 2018. ^ Rizvi, Husna (1 November 2018). "For climate action, 'mass civil disobedience' is the only way". New Internationalist. Retrieved 15 February 2019. ^ "TEDxStockholm Theme: Wonderland". TED. Retrieved 20 December 2018. ^ Queally, Jon (19 December 2018). "Depressed and Then Diagnosed With Autism, Greta Thunberg Explains Why Hope Cannot Save Planet But Bold Climate Action Still Can". Common Dreams. Retrieved 20 December 2018. ^ Jones, Nigel (30 December 2018). "Why we all need to be more like Greta". Nine by Five Media. Medium. Retrieved 15 February 2019. ^ Thunberg, Greta. "You Are Stealing Our Future: Greta Thunberg, 15, Condemns the World's Inaction on Climate Change". Democracy Now!. Retrieved 13 December 2018. You only speak of a green eternal economic growth because you are too scared of being unpopular. You only talk about moving forward with the same bad ideas that got us into this mess, even when the only sensible thing to do is pull the emergency brake. You are not mature enough to tell it like it is. Even that burden you leave to us children. […] And if solutions within the system are so impossible to find, then maybe we should change the system itself. ^ Thunberg, Greta (12 December 2019). "Greta Thunberg full speech at UN Climate Change COP24 Conference". ^ Larson, Nina (24 January 2019). "Time to 'get angry', teen climate activist says in Davos". news.yahoo.com. AFP. Retrieved 24 January 2019. I think it is insane that people are gathered here to talk about the climate and they arrive here in private jet. ^ Forrest, Adam (23 January 2019). "Record number of private jets to fly into Davos conference addressing climate change". The Independent. Retrieved 24 January 2019. ^ Kottasova, Ivana; Mackintosh, Eliza (25 January 2019). "Teen activist blames Davos elite for climate crisis". CNN. Retrieved 26 January 2019. ^ "Greta Thunberg: The Swedish teen inspiring climate strikes" (video, 2 min 4 sec). BBC News. 14 February 2019. ^ Hertsgaard, Mark (28 January 2019). "The Climate Kids Are Coming". The Nation. Retrieved 14 February 2019. ^ Busby, Eleanor (11 February 2019). "Children as young as five due to miss school for climate change protest". The Independent. Retrieved 14 February 2019. ^ Thunberg, Greta (25 January 2019). "'Our house is on fire': Greta Thunberg, 16, urges leaders to act on climate". The Guardian. Retrieved 14 February 2019. ^ Carmichael, Lachlan (21 February 2019). "Climate activist Thunberg urges EU to double carbon reduction targets". news.yahoo.com. Retrieved 22 February 2019. ^ "Swedish teen leads Belgian students on 7th climate march". Miami Herald / The Associated Press. 21 February 2019. Archived from the original on 22 February 2019. Retrieved 22 February 2019. ^ ""Vi vet – och vi kan göra något nu"". SvD.se (in Swedish). Retrieved 22 December 2018. ^ Gelin, Gustav (1 November 2018). "Därför nobbar Greta Thunberg klimatpriset". ETC (in Swedish). Retrieved 22 December 2018. ^ "Greta Thunberg blir Årets unga förebild". Aktuell Hållbarhet (in Swedish). 22 November 2018. Retrieved 22 December 2018. ^ "TIME's 25 Most Influential Teens of 2018". Time. Retrieved 22 December 2018. ^ dpa (8 March 2019). "Schulstreik fürs Klima – Klimaaktivistin Greta Thunberg in Schweden "Frau des Jahres"". Zeit Online (in German). Archived from the original on 8 March 2019. Retrieved 8 March 2019. ^ "Teen climate activist in Nobel Peace Prize race". The Hindu. Associated Press. 14 March 2019. ISSN 0971-751X. Retrieved 14 March 2019. ^ "Greta Thunberg nominated for Nobel Peace Prize for climate activism". BBC News. 14 March 2019. ^ Staff (18 March 2019). "Greta Thunberg wird mit der GOLDENEN KAMERA 2019 ausgezeichnet" [Greta Thunberg is awarded the GOLDEN CAMERA 2019] (in German). Goldene Kamera. Archived from the original on 31 March 2019. Retrieved 31 March 2019. ^ Seiring, Claudia (31 March 2019). "Verleihung der Goldenen Kamera Erst Klimaaktivistin geehrt, dann SUV verschenkt – Erst bekommt Greta Thunberg die "Goldene Kamera". Dann verschenkt Hauptsponsor Volkswagen einen SUV. Das stößt auf Kritik". Der Tagesspiegel (in German). Archived from the original on 31 March 2019. Retrieved 31 March 2019. ^ "Greta Thunberg lauréate du Prix Liberté !" (in French). Région Normandie. 1 April 2019. Archived from the original on 10 April 2019. Retrieved 14 April 2019. ^ Brochmann, Grete; Solhjell, Bård Vegar, eds. (12 April 2019). "Fritt Ords Pris 2019 til Natur og Ungdom og Greta Thunberg" (in Norwegian). Fritt Ord. Archived from the original on 15 April 2019. Retrieved 14 April 2019. ^ Rosane, Olivia (14 March 2019). "Greta Thunberg—Swedish Teen who Inspired School Climate Strikes—Nominated for Nobel Peace Prize". EcoWatch. Retrieved 22 March 2019. ^ González, Emma. "Greta Thunberg". Time. Retrieved 18 April 2019. ^ Milarepa, Fundación (19 April 2019). "Greta Thunberg Winner of the Laudato Si' Prize 2019!". FundaciónMilarepa. Archived from the original on 20 April 2019. Retrieved 20 April 2019. ^ Sandler Clarke, Joe (7 February 2019). "The Climate Change Deniers Trying to Discredit Greta Thunberg". Vice. ^ Oroschakoff, Kalina (February 2019). "Teen climate icon used for fundraising without her knowledge". Politico-EU. ^ "Swedish start-up used Greta Thunberg to bring in millions". Svenska Dagbladet. ^ "Start-up used teen climate activist to raise millions: Swedish paper". TheLocal.se. 9 February 2019. ^ Thunberg, Greta (2 February 2019). "Greta Thunberg". www.facebook.com. Retrieved 15 February 2019. This page was last edited on 22 April 2019, at 06:41 (UTC).